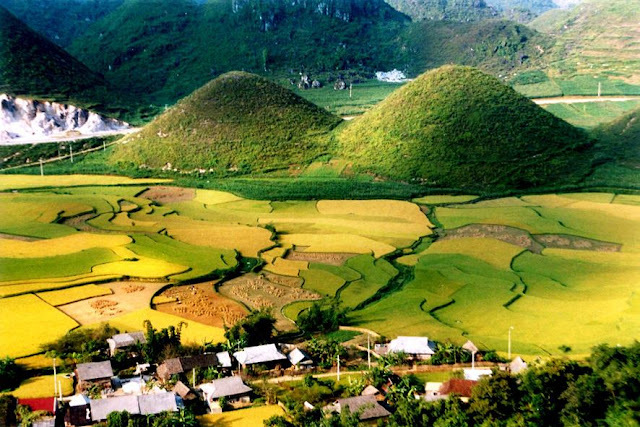 Quan Ba twin mountain is associated with to many interesting legends that the ethnic minority here has transmitted from generations to generations and they exist until today. There has been a very touching story that: In the past, in this area, there was a handsome H’mong boy, who was talented at blowing “dan moi” (lips herd). The sound of his “ken moi” was as harmonious as the streams, as chattering and pleasant as the chirp of birds in the forest, sometimes, it was as deep, melodious as the night wind. In th Heaven, there was a very beautiful fairy named Hoa Dao. She accidentally heard the sound of “dan moi”; therefore, she sneakily went to the Earth to find the owner of “dan moi” sound. She fell in love with the boy, so she found ways to stay in this land. They got married and gave birth to a pretty son. 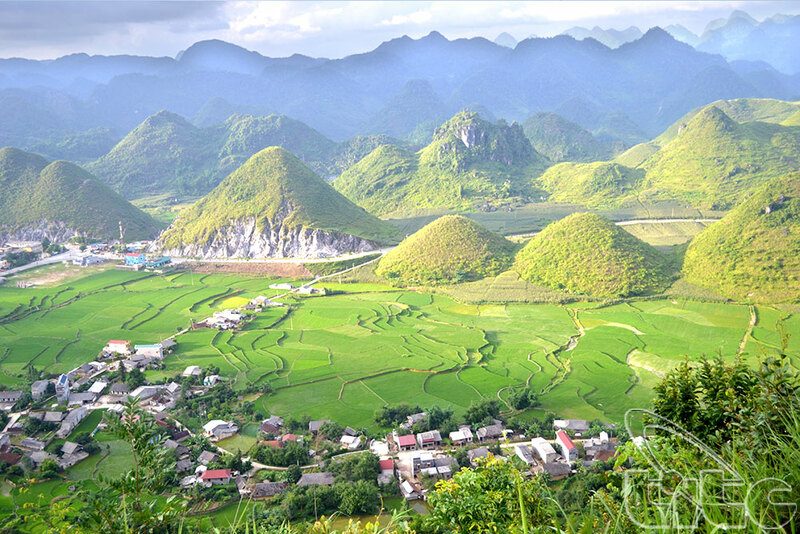 Quan Ba twin mountain in Ha Giang is associated with to many interesting legends that the ethnic minority here has transmitted from generations to generations and they exist until today. There has been a very touching story that: In the past, in this area, there was a handsome H’mong boy, who was talented at blowing “dan moi” (lips herd). The sound of his “ken moi” was as harmonious as the streams, as chattering and pleasant as the chirp of birds in the forest, sometimes, it was as deep, melodious as the night wind. In th Heaven, there was a very beautiful fairy named Hoa Dao. She accidentally heard the sound of “dan moi”; therefore, she sneakily went to the Earth to find the owner of “dan moi” sound. She fell in love with the boy, so she found ways to stay in this land. They got married and gave birth to a pretty son. The Jade Emperor (The Ruler of the Heaven) found that Hoa Dao had fled to the Earth and got married the human, he was extremely angry and sent his underlings to take her back to the Heaven. She tearfully begged his father for permiting her to stay and take care of the baby but he refused. Thinking about the situation when her husband had to raise the child lonely, and the son would be lack of breast milk, she decided to leave her breasts on Earth. The plump breasts fed the boy, and later turned into two mountains which were in shapes of the breasts. The two mountains are called “Twin mountain” of Co Tien (Fairy) mountain. Legend has it that thanks to her milk flows, the weather in this region was extremely cool, fruits like peaches, plums, pears, pink, ... had delicious flavour, the vegetables, rice and corns were fresh. Missing husban and son, she cried and her tear mourning her were turned into the blue Mien river embracing the land behind the legendary Heaven gate. There is also another story about young couple in love. The giant boy fell in love with a beautiful girl here. Though they were far away from each other, the boy always wandered up hills and down dales or crossed the deep streams to meet his lover living in this beautiful valley. Family of the girl wanted to test the strength of the Highlander boy; therefore, they challenged him that if he could stop Dong Ha River’s flow from flowing back into the valley where her family lived (Tam Son town today), her family would accept him as a son-in-law. 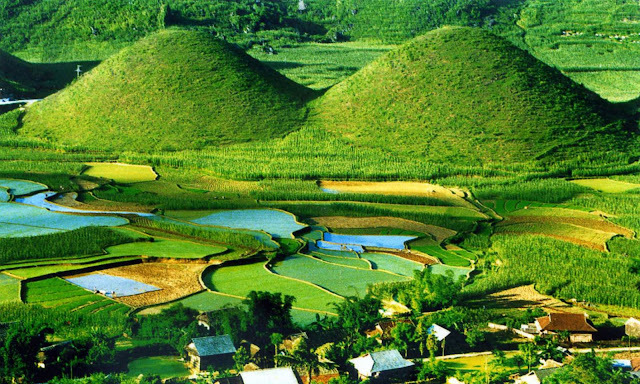 The giant accepted the challenge, he ate 7 pots of rice each meal, carried the mountains to the valley day and night to stop Dong Ha River from flowing into the valley. One day, when the boy was working, he suddenly heard about his mother’s death, he was extremely shocked and painful, he hurriedly returned to his hometown to wear mourning for his mother, but he never came back to the valley. The faithful girl languishly waited for her lover, every day, she walked around the valley to see the unfinished achievements of his, her eyes always looked toward the Heaven gate, she leaned her back on near the his pole to look forward to him and she waited in such a long time that she turned into a mountain.